Thisstory was corrected on Sept. 3. Afresh crater on Mars has revealed a hidden cache of frozen water in some of thelatest photos from a powerful NASA spacecraft. Theyoung crater is in the northern hemisphere of Mars. Scientists suspect itformed only recently, sometime between April 2004 and January of this year,said Nathan Bridges, a HiRISE science team member at the Applied PhysicsLaboratory. Bridgessaid the icy crater is farther south than some other sightings of buried waterice. It appeared in one of hundreds of Mars photos taken between June 6and July 7 of this year. "It'sshowing we're getting ice pretty far south," Bridges said. "As wecontinue to look at these things it's a good way to determine where shallow iceis on Mars." The icepatch covers an area of up to 20 square feet (2 square meters). It "isprobably at the same depth and has a similar origin to that excavated by thePhoenix lander back in 2008," he wrote in animage description. NASA'sPhoenix Mars Lander touched down in the Martian arctic in May 2008 and found evidenceof water ice just beneath the surface using a small scoop at the end of itsrobotic arm. Thisalso is not the first time ice-filled Martian craters have been found andphotographed by the HiRISE camera. 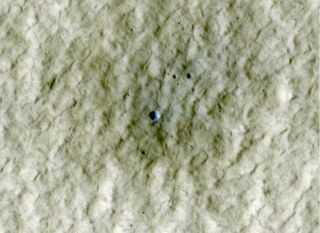 Theorbiting spacecraft first spotted exposed ice inMartian craters in August 2008 and scientists announced the discovery inSeptember 2009. The ice did not last, it ultimately turned straight into vaporin a process known as sublimation. There is no definitive proof of liquid wateron Mars today. Scientistswere surprised at the time to find the water ice was 99 percent pure, with justa smidge of Mars dust mixed in. A layer of ice could have remained insulatedfrom the Martian environment for up to 400,000 years until an impact disruptedits protective covering, a team of Mars researchers said in 2009. "Thatis why people think it's so pure, because it's fairly young and hasn?t beenmixed in with other materials," Bridges said. Comethe next Martian summer Bridges said, the HiRISE team will likely takeadditional pictures to check up on the crater. Editor'snote: This story has been corrected to reflect that Nathan Bridges is based atthe Applied Physics Laboratory at Johns Hopkins University in Maryland, and toremove an incorrect statement on the age of the water ice.